I've got another project from the September Make and Take to share with you today! This one is a fun Birthday card! This fun card was inspired by Chiaki's card that you can find HERE. To make this fun birthday card start off with a piece of Summer Starfruit card stock cut at 5-1/2" x 8-1/2" and score it at 4-1/4". 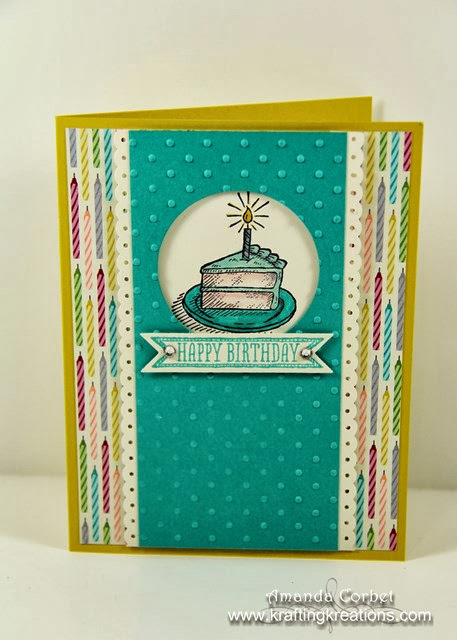 Cut a piece of Birthday Basics DSP 4" x 5-1/4" and adhere it onto the card front. Cut a piece of Very Vanilla card stock 2-3/4" x 2-3/4". Stamp the cake slice from Sketch Birthday onto the card stock in Stazon ink and color in the cake slice with your markers. For the inside of the cake use your Blender Pen to pick up a little bit of ink from your Crisp Cantaloupe ink pad lid to add a slight pink color to the cake. Cut a piece of Bermuda Bay card stock 3" x 5-1/4". Use the 4th from smallest Circle Framelit and the Big Shot to cut a hole in the top of the card stock. Then run your card stock through the Big Shot again in the Perfect Polka Dots embossing folder. Next cut a piece of Very Vanilla card stock 5-1/4" wide and punch two strips with the Dotted Scallop Trim punch. Adhere the strips half way behind the edge of the Bermuda Bay card stock with 2-Way Glue Pen. Adhere the stamped and colored card stock with the cake slice onto the backside of the Bermuda Bay card stock with Stampin' Dimensionals. Make sure that your cake slice is centered in the little window. Now adhere this layer onto the card front with Stampin' Dimensionals. Stamp the Happy Birthday greeting from Sketched Birthday onto a scrap of Very Vanilla card stock in Bermuda Bay ink. Cut it out in the Big Shot with the Bitty Banners Framelits. Add a small Rhinestone onto each end of the banner and adhere the banner onto the card front with a couple Stampin' Dimensionals. Finally stamp the cake slice and party hat on the inside of the card. Color in the images with your markers. Stamp the eat cake image at the top in Bermuda Bay ink and color in the banner with the Pool Party marker. 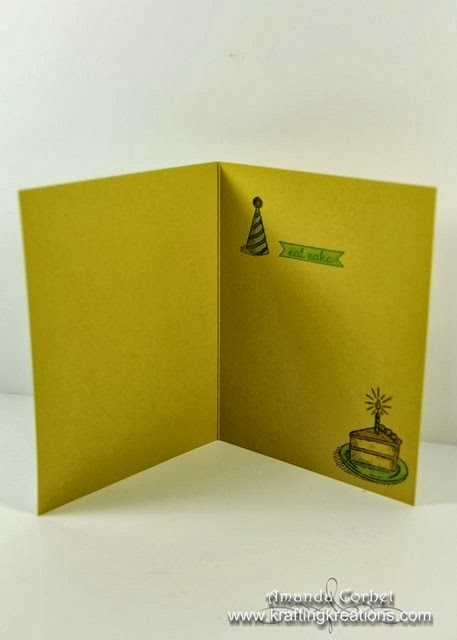 Now you have a fun and cheerful birthday card!